This update works for your Kindle Voyage with 6" High-Resolution Display (300 ppi), PagePress Sensors, and Wi-Fi . At only 7.6mm thin, Voyage is our thinnest Kindle ever. 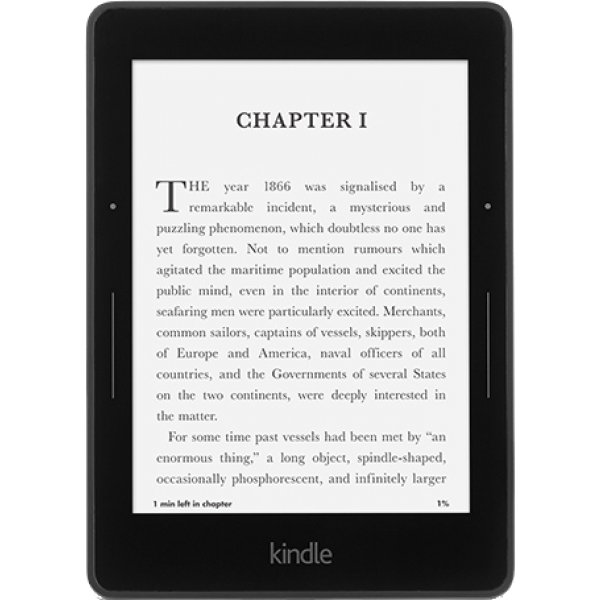 Kindle Voyage was designed to come one step closer to a sheet of paper, with a flush-front bezel for a clean, streamlined design. With a magnesium back and a specially-reinforced glass front, Kindle Voyage is both durable and sleek. Kindle Voyage features our brightest, highest resolution, and highest contrast display of any Kindle. The micro-etched glass display diffuses light to eliminate glare and matches the feel of paper. In order to more closely resemble reading on real paper, we researched and hand-tuned the optimal brightness setting for every lighting condition. The new adaptive front light automatically adjusts the brightness of the display based on your environment, and can even be fine-tuned further to your personal preferences. When reading in the dark, the adaptive front light slowly lowers the display's brightness over time to match the way the eye responds to darkness. General improvements and performance enhancements. Improvements to tables that contain images: Images inside tables are now more proportionate to the table dimensions. Auto-shelving enhancements for Goodreads users: If you've linked your Kindle with Goodreads, you'll have the option to add your books to your Goodreads shelf from the About this Book and Before You Go sections of each book.